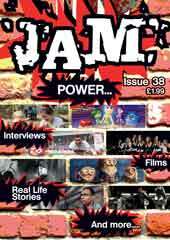 JAM Mag is a multi-purpose resource aimed at young people between the ages of 11 to 17. We're hoping to facilitate a 'God connection' with young people from either a church or non-church background. One of our aims is to show how the Christian faith is culturally relevant outside of church. JAM is printed on a termly basis – release dates are early Jan / May / Sept.
Each Issue of JAM has a central theme running through it – thus all the articles are linked to the theme BUT if only one article is read it makes sense on its own. There's usually around 20 articles per mag, thus there's enough material to use the mag as an activity or discussion starter in a group setting for a term. These are many and varied and include : drop in or café style clubs / after school clubs / schools work / youth groups / one to ones / events / discipleship / presents etc......for discussion, browsing, or some people use the mag to create a 'pack' [mag + other stuff] for either publicity / welcome / invitation or enquirer purposes..... we can provide mag size grip seal bags for this [normally no charge]. Small quantities cost £1.99 + p&p. Our 1st price break is at 20 mags - cost £36.00 incl p&p [£1.80 / mag] from this quantity onwards the more mags bought the cheaper the price per mag. We also sell back copies at half price. More details about JAM can be found on our website www.jammag.co.uk where sample pages & full back copies can be viewed online.